Your Search is OVER. Factory Style Low profile, any profile White Letter Tires Kits are the answer to the dilemma that tire manufacturers do not offer RWL tires in low profile sizes, or just about ANY size these days. Transform any set of tires- Low Profile to Any Profile- into white letter tires. Our innovative white letter inserts allow you to turn any set of tires into REAL white letter tires without the time, mess and fast-fading results of tire paint. 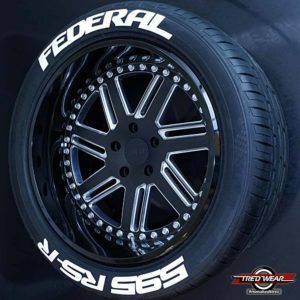 Factory Style for Low profile, any profile White Letter Tires Kits for your vehicle are here now! 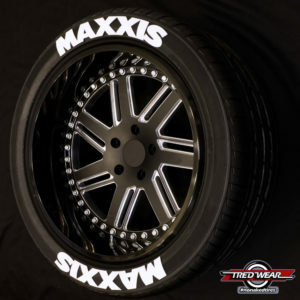 We will make your “white letter tires” kits to match the letters or numbers on all types of tires, minus any logos. Each order receives the white letters and numbers with the special adhesive that perfectly fits all tires, regardless of size or type. We are using a rubbing of the tire to create an accurate template for recreating your white wall letters. This is accurate since it eliminates the curve of the tire as a factor. 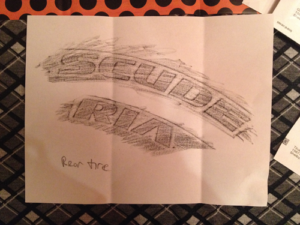 Simply take a sheet of copy paper and rub a crayon or similar over it until you get a nice impression. Then take the rubbing and place on a table. Hold your phone above until all four sides are visible and straight like the picture to the side and text to us. No measuring needed! Why don’t they make RWL tires in low profile sizes? Here at TredWear we are not sure, but now you don’t have to wonder any more. Regardless whether you have a 38.5/15 Mud tire on your ’76 Bronco or a low profile 335/30r20 on you Aventador, nothing is too exotic! We have the solution! 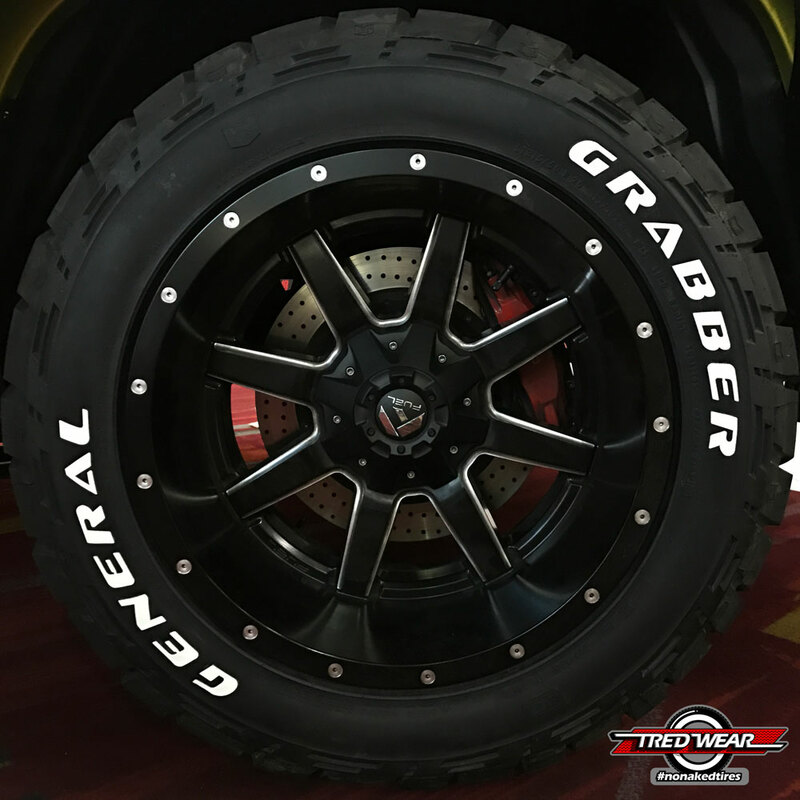 Our white letter tires kits can be applied in minutes, giving a show quality appearance that stands up under scrutiny. Friends will wonder how you found factory Raised White Letter tires which are unavailable in that size. Factory Style Low profile, any profile White Letter Tires Kits will fit ANY size tire. The tire lettering kits last the life of your tire, saving you the hours of application and re-application that tire paint will costs. Our patented combination of durable rubber letters and instant adhesive actually work together to bond the white letters to to your tires like they were part of the sidewall. We guarantee that if installed correctly, our white letter tires will last the life of your tire. Nothing takes a brutal pounding like a big truck tire. Our kits were tested for 100,000 miles of the hardest abuse on semi tires. They have even been reported to survive the retread process. Each Factory Style Low profile, any profile White Letter Tires Kits will complete a single tire. Every order will receive our custom cut rubber letters with advanced adhesive to convert your BORING black-walls into head-turning tires. In addition, you get the value of saved time and frustration.